We did a 3 day/2 night backpack trip from the South Rim in Grand Canyon National Park in Arizona. 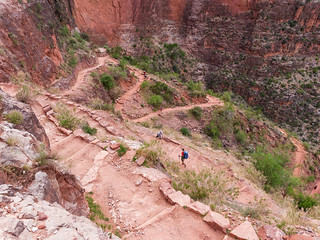 We descended into the canyon on the Bright Angel Trail to the Tonto Trail and camped our first night at Horn Creek. We continued on the Tonto Trail and camped our second night at Monument Creek. We hiked out on the Monument Trail and Hermit Trail.